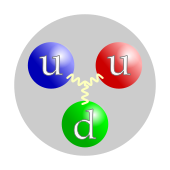 The quark–lepton definition of ordinary matter, however, identifies not only the elementary building blocks of matter, but also includes composites made from the constituents (atoms and molecules, for example). Such composites contain an interaction energy that holds the constituents together, and may constitute the bulk of the mass of the composite. As an example, to a great extent, the mass of an atom is simply the sum of the masses of its constituent protons, neutrons and electrons. 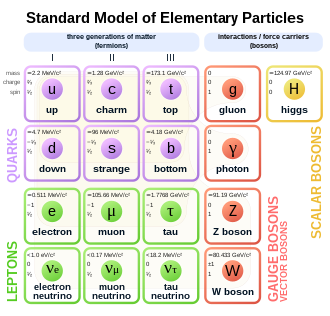 However, digging deeper, the protons and neutrons are made up of quarks bound together by gluon fields (see dynamics of quantum chromodynamics) and these gluons fields contribute significantly to the mass of hadrons. In other words, most of what composes the "mass" of ordinary matter is due to the binding energy of quarks within protons and neutrons. For example, the sum of the mass of the three quarks in a nucleon is approximately 7001125000000000000♠12.5 MeV/c2, which is low compared to the mass of a nucleon (approximately 7002938000000000000♠938 MeV/c2). The bottom line is that most of the mass of everyday objects comes from the interaction energy of its elementary components. ^ a b c R. Penrose (1991). "The mass of the classical vacuum". In S. Saunders; H.R. Brown (eds.). The Philosophy of Vacuum. Oxford University Press. p. 21. ISBN 978-0-19-824449-3. ^ "RHIC Scientists Serve Up "Perfect" Liquid" (Press release). Brookhaven National Laboratory. 18 April 2005. Retrieved 15 September 2009. ^ T. Hatsuda (2008). "Quark–gluon plasma and QCD". In H. Akai (ed.). Condensed matter theories. 21. Nova Publishers. p. 296. ISBN 978-1-60021-501-8. ^ Persic, Massimo; Salucci, Paolo (1 September 1992). "The baryon content of the Universe". Monthly Notices of the Royal Astronomical Society. 258 (1): 14P–18P. arXiv:astro-ph/0502178. Bibcode:1992MNRAS.258P..14P. doi:10.1093/mnras/258.1.14P. ISSN 0035-8711. ^ D.L. Schindler (1986). "The Problem of Mechanism". In D.L. Schindler (ed.). Beyond Mechanism. University Press of America. ^ P. Schmüser; H. Spitzer (2002). "Particles". In L. Bergmann; et al. (eds.). Constituents of Matter: Atoms, Molecules, Nuclei. CRC Press. pp. 773&nbsp, ff. ISBN 978-0-8493-1202-1. ^ W. Greiner (2003). W. Greiner; M.G. Itkis; G. Reinhardt; M.C. Güçlü (eds.). Structure and Dynamics of Elementary Matter. Springer. p. xii. ISBN 978-1-4020-2445-0. Wikimedia Commons has media related to Matter.